These are bite-sized studies in the Gospel According to Matthew. 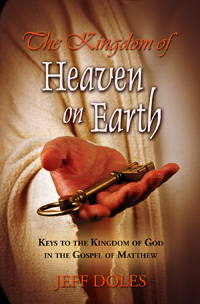 Jeff Doles in his new book The Kingdom of Heaven on Earth excellently emphasizes, "On Earth", and NOW! Journeying through the nuggets of our Father's Kingdom through the book of Matthew, Jeff presents practical revelation towards activating a "More Excellent Way" towards transformation of our lives, and the lives of others. I recommend it highly."